44th & Goal: What's in a Name? Short answer: apparently a lot. The long answer sheds more light on the subject, however. The team name doesn't predict success or marketability but instead symbolizes past glory, championships, great players, and memories of a stadium packed to the gills with fans screaming as loud as they can, seemingly willing the team to victory. Or at least, that's what a great brand does. A poor brand does just the opposite: it reminds a fan base of its lack of glory, draft busts, poor management, and empty seats. On either side of the coin, logos and uniforms reinforce the message. 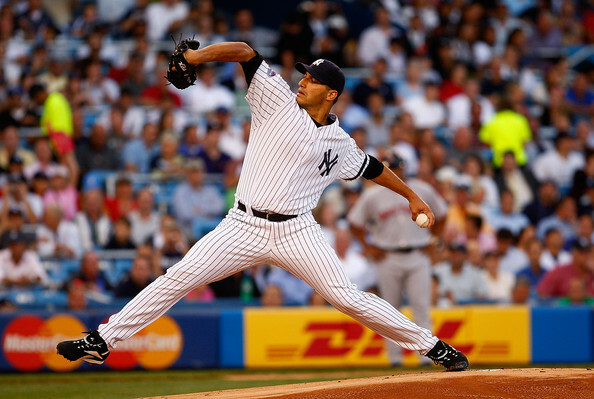 On the positive branding side, all arguments start with the New York Yankees. The Yanks recently dethroned Manchester United as the most valuable team brand in the world. Obtaining the top spot on the list has a lot to do with the 27 championships the Bombers have brought to the Bronx, especially since merchandise sales from #27 (and a new ballpark) directly pushed them past Man U. Part of what the Yankees have done to build their brand has nothing to do with winning, though. Their uniforms haven't changed in decades, nor has their policy on player facial hair (trim those sideburns, Boggs!). Their cap has become a staple of not only baseball, but the hip-hop industry as well. In addition, they are known for an entire style of uniforms (pinstripes). Although their payroll dwarfs that of most of their competition, it's a winning formula, and that's exactly what they're banking on. Manchester United, the number two brand, might not be behind for very long. They recently signed a new jersey sponsorship (which I've never liked about soccer, as it promotes a company that has nothing to do with the sport before the team) worth 50 percent more than their previous deal. Man U's real strength is its expansive global fan base, which is over 300 million strong. Real Madrid of Spain's La Liga is third on the list. The NFL's top team brand, the Dallas Cowboys, ranks #4 worldwide. The reason for the high ranking is the expanse of the Cowboys' fan base, which cover the entire US in some capacity and has developed a large following south of the border. In fact, the Cowboys' brand is so strong, the team has opted out of the NFL's merchandising program. Rounding out the middle of the Top 10 are soccer giants Barcelona, Bayern Munich, and Arsenal, while the Boston Red Sox, New York Mets, and New England Patriots fill out the bottom of the order. On the other side of the coin, two NBA teams are considering going beyond the traditional graphic re-brand and looking into a name change. The "Wizards" and "Nets", who are in the earliest stages of looking into new monikers, have two things in common: lackluster histories and new ownership. The Washington franchise officially made the switch from Bullets to Wizards in the summer of '97 because of violence in the DC metro area. Since then, the team has been routinely mediocre or worse, only winning one playoff series in the past 13 years. Not to mention this doesn't help. If the team paid for a professional-grade logo that didn't look like child art and a color scheme (blue/black, currently) that wasn't used elsewhere in the league, the Wizards name might have had a chance. And it still might, because of how ridiculous the old name was. After the Gilbert Arenas incident, you'd think "Bullets" would be the last possible choice. The Bullets scheme would also need some work. With Atlanta in the same division, and the Sixers and Nets close by, does the NBA really need another red/blue team? I think not. However, if the Wizards unveiled an original scheme and a well-crafted logo set, they could save their brand. The Nets toyed with the name change idea recently, as their new owner Mikahail Prokhorov was meeting with the media. With the team moving into a new Brooklyn arena in the coming years, it could be the perfect opportunity to re-brand the team and market it with a global focus. Although any talk of that is preliminary, it could pose an interesting situation. The third naming/re-naming situation that occurs involves a team with a storied tradition moving away and the fans fighting the keep the names. The two greatest examples of this are the Cleveland Browns/Baltimore Ravens debacle and the Seattle Supersonics/Oklahoma City Thunder hijacking. In both situations, the jilted city sued the franchise to retain the name, and in the case of the Browns, later used the name on an expansion team. In conclusion, there's a lot in a name, especially when a team invests the resources and build euity in the identity. 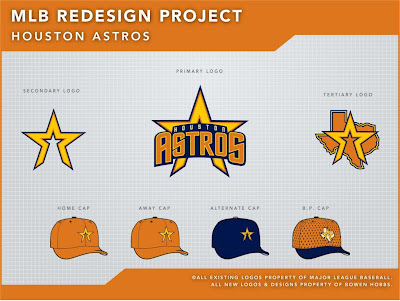 Today's design features the Brewer's current foe, the Houston Astros. As a child, I remember watching the 'Stros and thinking "those are some great uniforms." They were a toned-down version of the 70s classics, but the line the uniforms walked between unique and restrained was masterful. They owned the "rainbow". Then they switched to these. That's when it all went down hill. The 90s uni's were boring in color and the star was too angled and overbearing. The team tried to tone the new star down in the latest set, but stripped the team of the last of its identity by switching the color palette to black, red, and gold. My concept rotates the current star to givethe logo an uplifting feel that reminds people of blast off. The type uses a sci-fi font that further reinforces the NASA-inspired space theme. I kept the star-on-Texas tertiary logo, but with the rotated star. 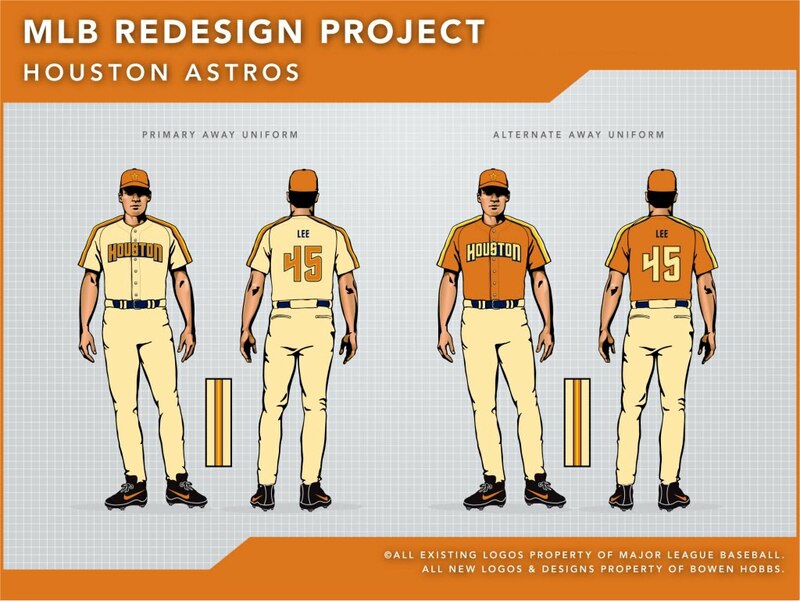 The home uniforms start with a cream-colored base. From there, I used the sci-fi script and revived the "racing stripes" from the late 80s/early 90s. Orange is now the primary color, as no team in MLB uses that color in that capacity. 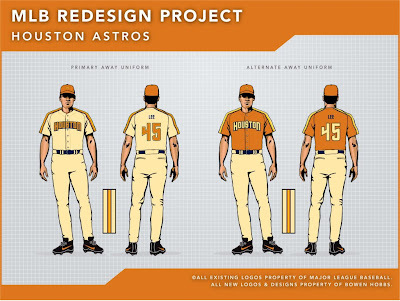 The home alternate jerseys are orange with a cream script and, of course the racing stripes.The away uniforms feature a matching HOUSTON script on a pale yellow base color that I call "butter". Once again, there is an orange alternate jersey. 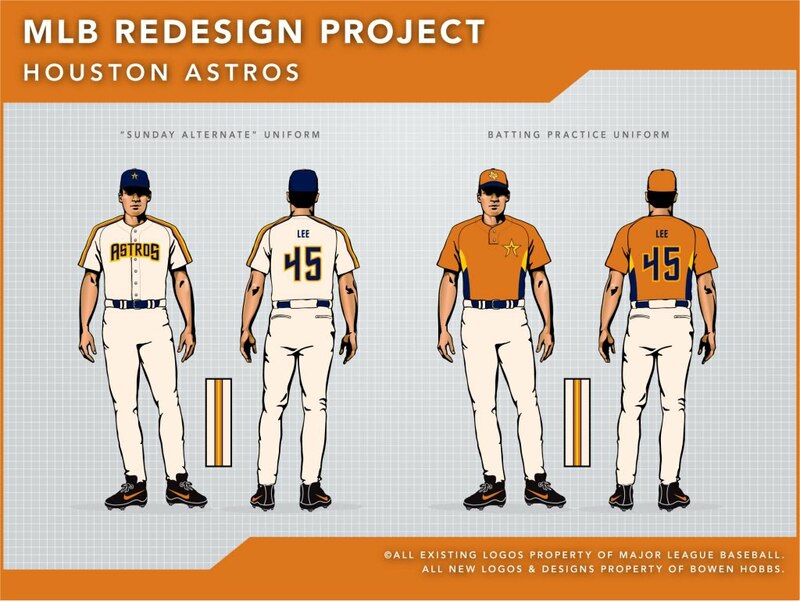 The Sunday Alternate is a navy version of the primary home uniform that evokes the early days of Biggio and Bagwell. The result is the idea of a "modern classic". Feel free of leave a comment about naming, sports branding, or the Astros concept above.